Just an idea I tried.. it's not a build thread. It's come to my attention that the board that was previously in that case was quite small. The board I am putting in would interfere with the radiator. Not a big worry. The radiator is moving to the front of the box. The side radiator hole will now be a window with a Evercool aluminum frame 120 in it. The left side window will have 3 of the same aluminum frame 120's. 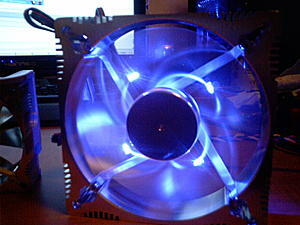 The rear will have 2 of the 80mm version of the same fan. The reservoir is Going to be a small fish tank. Yes, a fish tank. I found an interesting Betta tank with a bowed front that I am building into the bottom front corner of the left side window. It's 5.5 cubed plus the bow area. I'm using UV reactive tubing, and a D-tek Fuzion block. Every fan in the box will be intake except the PSU, obviously. I may go 1 in 1 out on the 80's to stir the air around the Mosfets. I may also add another 80 to the floor of the case to feed the 8800's fan fresh air. I takes 3 80's to move the air of a 120, so I could make all 3 80's Exhaust, and still have 2 120's pushing through the heater core. With these fans that would only be a combined 135 cfm or so, though. 6 laser LEDs light my current PC rather well, so I ordered 20 (5x4) LEDs for this case. Everything mentioned is ordered. Update in a week or so I guess. Last edited by Azriel; 22nd April, 2008 at 02:37 PM. My 700 GPH Danner MagDrive generates 55w when pushing it's rated 14' of head pressure. Can't wait to see pics. That res should look sweet. Yeah, but then again, my DD waterblock needs a powerful pump to work well. my pump only go 11.5 feet vertical. I R teh suk. I dropped the heater core off to have the tubes replaced with barbs today. It's running me a bit more than $20, but still cheaper than buying an inefficient radiator. On a lighter note, the guy who wrote the review I read that sent me to buy a Fuzion is at times, a bit full of himself. It's incredibly annoying to me when people give simple items fancy names. I was a little confused for a few minutes when I read one of the "cons" of the fusion. He complained that they could have provided "Worm drive bands" for the price. OMG jackass, it's a hose clamp. it was a hose clamp 30 years ago, and it still is. Get over yourself, imo. Last edited by Azriel; 22nd April, 2008 at 10:42 PM. This was supposed to be cool, as in something somewhat off the beaten path. Hmm... well yeah.. but the heater core won't fit in that cool place you wanted to put it. Hmm... well a tiny window on the wrong side of the box, that's not too innovative, is it? Guess not. But the fish tank! That's not cool, that's lazy. Well yeah, I guess you're right there. So, I was looking at the box, and I'm thinking... What about some fancy design for a top window? Cut in a biohazard with a fan on the middle. Lame. Okay, how about some tribal art kinda stuff in the top. Ummm function over form, jackass. Well, I was really looking at the top of the box. I started drawing up ideas. Then I got one that is actually kinda cool. It's so simple, that I really don't know why I've never seen anyone do it before. Remember the problem I was having with airflow because the PSU has to blow out? Well, it still does need to blow out, but who says that air has to come from inside the box? Exactly. The PSU is getting mounted in the stock location, only upside down. 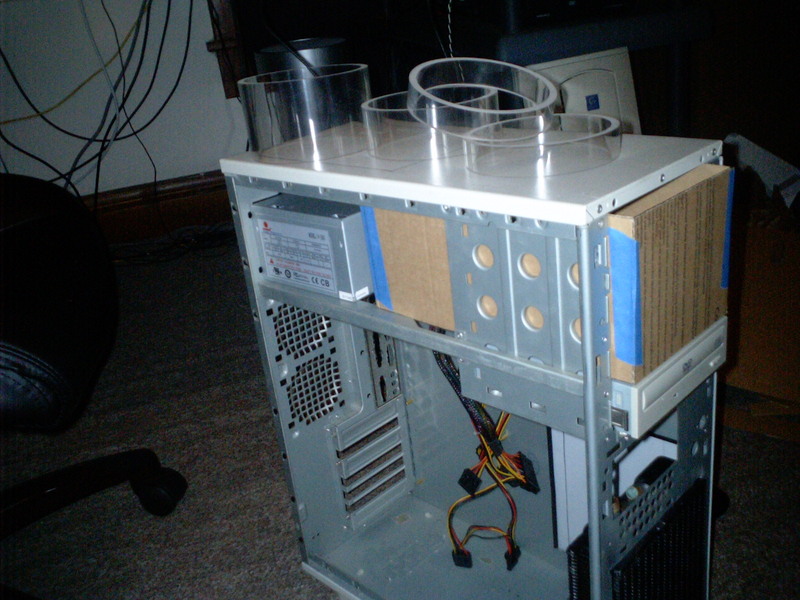 The fan that draws air into the PSU from what is normally the bottom will be ducted out the top of the case, so it is drawing air from outside the box. There's a small problem with this. 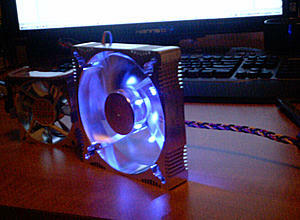 The fan bus determines the speed to run the case fans based on the temp of the air flowing through the PSU. It won't know what the hell is going on inside the box. I'm going to need to run the fans on normal power connectors, and only let it regulate the speed of it's own fan. Sounds good to me anyway. 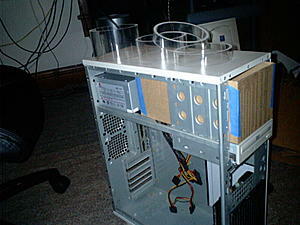 I'll be using a 1/4 inch thick 4.5 inch ID clear polycarbonate tube from the PSU to a small square window above it. I might cut the tube on a slight angle and offset the window just to make it look a little different. Last edited by Azriel; 23rd April, 2008 at 10:05 PM. The minimum order on the 5 inch tubing was 1 foot, I need about an inch and a half of it for the PSU, so the rest might get worked into the case here and there. I'm really getting into hacking this case up. I've never modded a case that didn't have a machine built in it already, much less stressful. I was thinking about going a little crazy on the window. Flat windows are boring. We are gonna be a little more 3 dimensional on this one. I'm going to need more material I think. Last edited by Azriel; 24th April, 2008 at 01:01 AM. OMG jackass, it's a hose clamp. it was a hose clamp 30 years ago, and it still is. Get over yourself, imo. As I understand it, the 'proper' technical name for them actually IS 'worm drive clamp', as 'hose clamp' encompasses not just the worm drive variety, but also spring clip and friction clip varieties (and probably others that I am not aware of). I basically agree with you though. But the fish tank! That's not cool, that's lazy. Well yeah, I guess you're right there. Dude! You're losing your whole focus here! The best mods are the ones that look neat but are lazy! LOL You've been doing this long enough to know THAT. 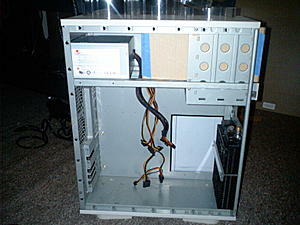 You should be able to open up the PSU and find the thermistor that regulates the fan control. It will most certainly be attached to the heat sink of the output FETs. There's no reason you couldn't run it outside the PSU and into the case somewhere. Use some shielded conductor wire, though. Add a quick-connect fitting with gold contacts, or at least make it so you can easily remove the thermistor if you need to extract the PSU, though. Not that it's a real important step to post a picture of, but these threads get pretty boring without the pretty pictures. Here's the heater core with the 1/2 inch barbs on it, mounted in the front of the case. It looks like hell because it has the residue from the pressure check tank on it. I just cut a piece of 1/4" clear lexan to hold it into the hole. I had to edit the front bezel very slightly to allow the radiator to go in the hole until the tanks hit. If you even mount one through the case like this, remember, there's not a straight side or a 90 degree corner anywhere on a heater core. Lots of file work to make it snug. Last edited by Azriel; 24th April, 2008 at 03:04 AM. 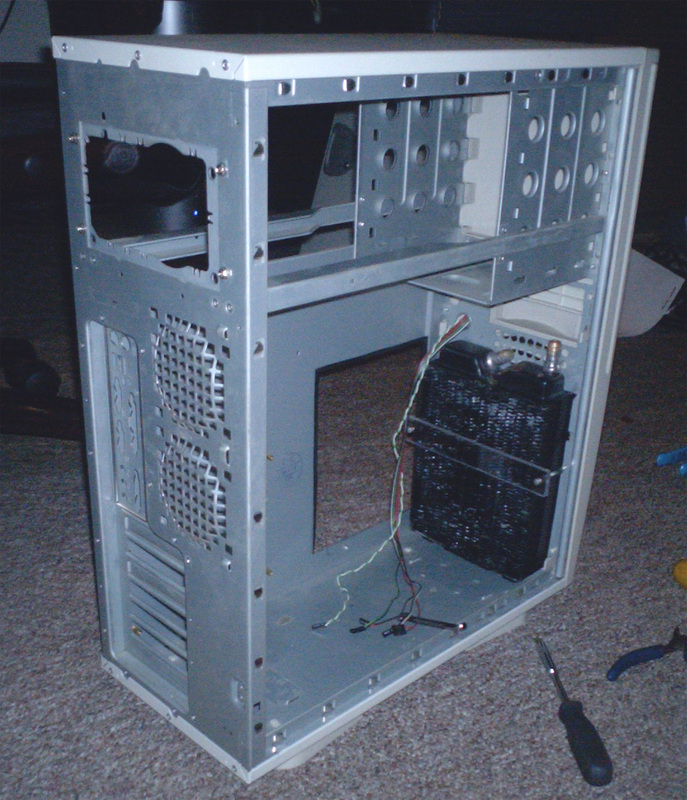 I got the little window in the side done and cut the piece for the PSU duct window. I managed to save enough material to do the big window, which is good. This stuff is damn expensive, and I don't want to order more. The bronze tinted stuff is UV tollerant, and it comes at a premium. I was looking into getting a little more of it, and I'm not paying $100 for a 2' x 4' sheet. Pics would be pointless, the protective film is still on. I have some 1/8 inch clear that I'm going to use to seal up the external 3.5" area above the radiator. Last edited by Azriel; 24th April, 2008 at 07:48 PM. Cutting acrylic tubing is easy with a hacksaw and a jig saw. i made a cut with the hacksaw, being very careful to stay straight with my tape line. Once I broke through, I switched to the jigsaw. Took about 20 min to carefully cut the duct for the PSU fan. Lapping it flat on the ends... omfg.. about an hour a side. Nothing worth doing is easy though. I hate acrylic, but I can't get polycarbonate in .250" wall thickness. The little fishtank came in and... ewww. Not gonna be using that POS. I'll craft up a reservoir. My lathe keeps dropping it's belt mid-cut, so I enlisted the help of my local evil toymaker. He's going to be turning the acrylic reservoir cap for me. The reservoir is going to be all UV reactive blue 1/4" acrylic. I'm using a bit of the 5" acrylic tube to have an opening big enough for the pump to pass through so I don't have to build it around the pump. The reservoir is now going to occupy the top three 5-1/4 bays and will be aproximately 6" wide X 5" tall X 10" deep, with the 5" dia. tube passing through a window in the roof, that it will be bonded to for support. In addition to using pvc cement to bond the tube, I'll be using the same 4 aluminum support bar design as the fan ducts. Pictures will make more sense. I hate waiting for shipping more than you hate waiting for pics. I will have no bay left for the HDD after doing this, so it's getting mounted to the small side window where the heater core was originally meant to be with a couple pieces of aluminum angle. Eventually I'll have to get a windowed raptor drive. I big bay res looks great though. I had a 3 bay unit for several years....I miss it. I have to cut 2 more pieces of the 5" tube, and lap 3. There's a lotta work yet to be done, but this thing is gona look sweet when it is finished. I still need to pick up a 4.5" holes saw for cutting the holes in the windows. I should be able to get it finished in the next couple weeks. Until you see more in progress pics, you really have no idea how much work is involved here. 4.375" x 10.125" x 5.25"
Basically 1.1 gallon capacity less the volume of the submerged pump, plus the coolant in the system. Overkill? Yup, but the reservoir size is dictated more by the size and shape of the pump than the required capacity. Hopefully, I can have the reservoir finished before I go to my friend's shop tomorrow to make the cap. If not, I'll just bring a lapped section of the 5" tubing for test fitting. You and your pics... okay, here's some pics. The reservoir is going to mpunt with the drive rails. The drive rails need to be trimmed at the back to allow me to get the filler neck in, but they will work just fine. Considdering the window above the reservoir will be most of the support for it. Unfortunately, the window will be polycarbonate, so I can't bond it. It will be bolted though. Last edited by Azriel; 30th April, 2008 at 07:39 PM.